OK, I think I get it. I've been collecting "stash" over the last year, for the first time in over 30 years of sewing. Everyone on the QB talks about their "stash". So, I went to Target, bought their $32.00 bookcase, came home, assembled it myself, and started collecting. I found as I sat and sewed (right next to my "stash"), the fabrics were speaking to me. I was daydreaming about how this fabric would look with that, and imagining patterns in my head. 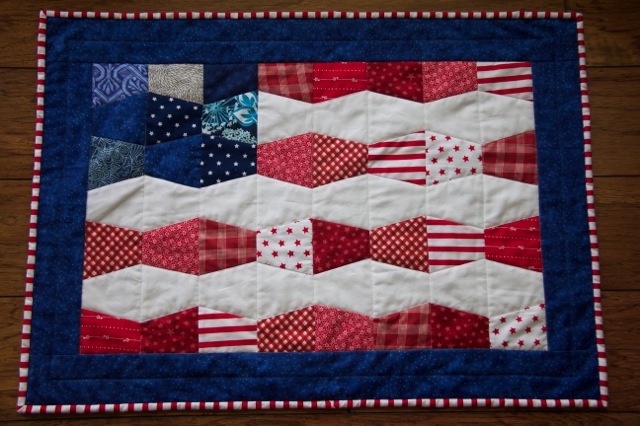 It was wonderful, when last weekend, I found this Flag Table Topper in Jenny's Quickly Quilting Magazine, and all I had to do was go to my "stash" and pick out the fabrics. I didn't have to go to the store - and I loved it. In times past, I would pick out a pattern and then shop for the fabric. I could never figure out why quilters wanted a "stash" because the amounts one would buy would never be the required amounts by pattern. PS: I'm accused of "taking over the Master Bedroom". It's the only place I have to sew. Last edited by Girlfriend; 07-02-2013 at 07:28 PM. Yup, that's how to do it - and that's why we do. That bookcase gave you the perfect inspiration in your sewing room. How much to buy really depends on you and your budget. I'm a very scrappy girl. Rarely buy more than half a yard at a time - unless it's a remnant or I need borders or focus fabric. Looks like you are into scrappy from your project. Have fun! with this crazy obsession. What a cute project and beautiful fabrics! Yes, it is very liberating to just decide on a project and be able to begin it right away. Keeping the stash under control is just as important as having one, however. That's a nice stash and a nice topper. You have quite a stash there. And it's so organized. If you buy much more you will need another bookcase .you stash is sooooo organised. Nice stash -- and a great project. I usually buy way too much, but if I think the fabric will be borders or binding for a full size quilt, I get at least 2 - 2.5 yards since I hate to piece borders that are all one fabric (now a piano key border is a whole other story ). The rest depends on if I like it or love it (I have been known to buy 6 yards of love it). You now have STASH!!! there's no turning back and there's no cure!! Don't you love it? Haha!! Welcome to the club!! You will now discover we are not really quilters!! We are fabric collectors!!! We have you hooked and there is NO cure!!! Love your topper. I made one too. Just need o put a border on it now. Love the binding on it. Where did you find it? Would love to finish mine. Love your stash too. Love your stash of fabrics! I love to collect 1930's reproduction fabrics and have a good sized stash of them. I love "shopping" from them. I love scrappy quilts. Love the topper also! I need to make one for next year. I usually buy 3 yards of any fabric on sale. 5 yards if I really love it and 9 yards if it will make great backing. I keep a lot of backing fabric of all colors and prints. That is where the money saving is, having a great supply of backing fabric. I usually buy at least 5-6 yards. I have bought remnants in smaller amounts. Some fabrics I have bought at least three times. I like to be able to pick out of my stash. I would not be able to make many quilts if I had to go to the store each time. I think you figured out why we want stashes. Looks like you are well on your way. Love your topper and your stash! From looking at your stash I see that I need to shop for more greens - you have such a nice assortment of color. When buying fabric I try to determine what its end use could be. If it looks like a great backing fabric, I'll buy 2.5 yards (I only make square quilts, largest 52"); if it's a stripe that will make a great binding, I'll buy a yard - half of that will go to binding, the other half will be cut into charm squares. Last week I bought 6 yards of a great fabric that I'll use as backing for three quilts for boys - it was white with red, green, yellow and blue emergency vehicles on it. Can you tell I'm excited to use it? Isn't this fun? What a beautiful stash! A work of art! When I first started buying fabrics for my stash, I would get 1 yard when it was on sale, a half yard when it was not. I love the idea of fat quarters, but you wind up paying $12 to $15 a yard when you buy it that way. So, half yards it is. Love your topper and the stash looks beautiful! Isn't it fun to have a stash that you can go to and make a project? Love the table topper! And your stash. I'm fairly new, but have started collecting fabric I fall in love with. Like you, I am never sure how much to buy since I rarely have no idea what I'll be making with it. So I usually get 2 yards AND will also get a 1/2 yard each or so of other fabrics in that same "line" (so I will have coordinating fabric already on hand once I get around to using it). And I love coming home with my latest find and researching it further on the internet. More often than not there are more delicious fabrics in that line available, and I end up buying at least 1/2 yard each to add to my collection. 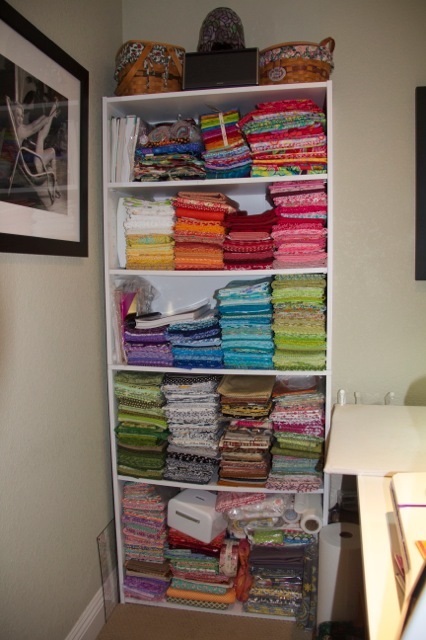 Right now my stash is sorted and stored by collection so that all of the matching fabrics are already together. If I see charms, layercakes, or jelly rolls of that particular line on sale, I usually buy it, too, again so I'll have plenty of coordinating fabric options to choose from! I made the mistake of JUST buying a couple of yards of a fabric I liked - I had an idea of what I wanted to make and figured I'd get the rest of the fabric later. Well by the time I got around to making my project, that line was discontinued, and trying to find something to match or go with it was frustrating and wasn't fun. Live and learn! You've done a great job. I love how organized everything looks. Your table topper is wonderful. ...and the fun, joy, inspiration, contentment, anticipation, dreams, giving, sharing... are all why we enjoy quilting so much. Nice quit.